n M.P. combines the advantages of H.V.L.P. and conventional spray gun: lower inlet pressure but high work rate. n M.P. provides the finest result and still saves material at the same time. n High transfer efficiency, Reduce overspray and save painting cost. n Top quality spraying result makes this spray gun the ideal for manufacturing, building sector, and automotive industry. n New air cap design for finest atomization. n Suitable for polyester, filler or other high viscosity materials. n B.P. gun can spray from small spot repairs to large surface. n Suitable for large-sized goods and vehicles. n Low pressure to let air spray for small amount, which is best suitable for repairing. n Special paint 4 nozzles design is better for pelletizing, no matter oil or water paints. n Large pattern width design can save time for area. n The special design of cap make excellent atomization. 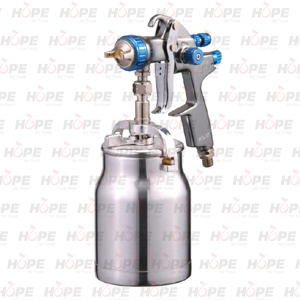 n Each spray gun is under 3kg/cm² strictly outlet paint pressure and atomization testing. n Can be used together with Tank & Pump.